It's time to lead your team of honey-mining bears into Mount Honeycomb! Collect honey to hire more bears and uncover valuable riches at the mountain's core. Find enough royal jelly to be crowned the new ruler of the land! 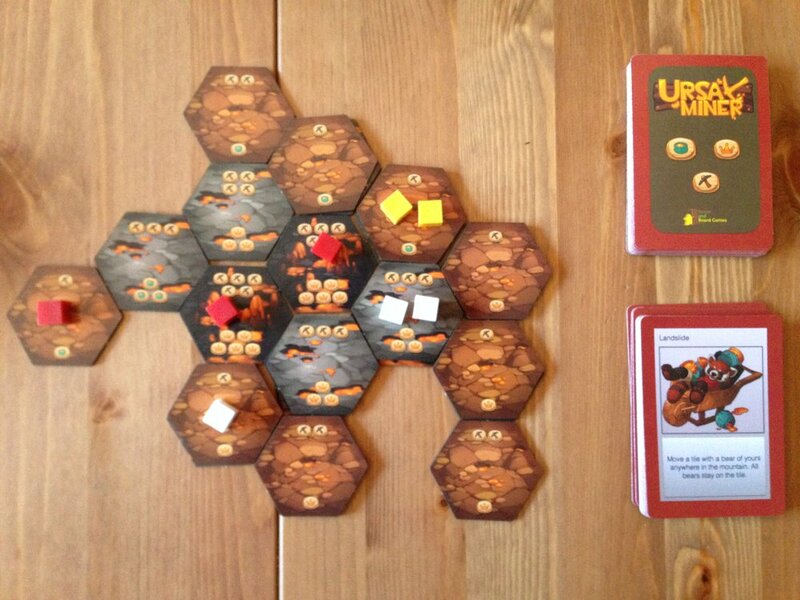 Ursa Miner is an easy-to-learn game that's fun for the whole family. Mine your own path to victory as Mount Honeycomb crumbles around you. Be sure you're prepared to dodge, block and scare other bears along the way! The Kickstarter copy of Ursa Miner will feature 42 hexagonal mountain tiles, 20 adorable bear meeples, and 28 beautifully illustrated cards. Please sign up below to get informed when we launch! Sign up with your email address to receive news and updates about Ursa Miner. This is a game for any number of people about not pushing the button. On the count of 3, everyone throws a hand symbol to show whether or not they push the button. If nobody tries to push the button 3 times in a row, everyone wins. If, however, you are the only person to push the button, you destroy the world and win the game. But, if more than one person pushes the button, it malfunctions, everyone dies, and loses. You can also choose to watch the button. If you do, and someone tries to push the button, they are caught and lose. But, if nobody tries to push the button, you die of embarrassment and lose. Be a pal, don't push the button! Be a jerk, push the button! Or, keep an eye on the button!